Grantham Journal 8th 1939 - first part of the article. Grantham Journal 8th 1939 - second part of the article. Grantham Journal 8th 1939 - third part of the article. 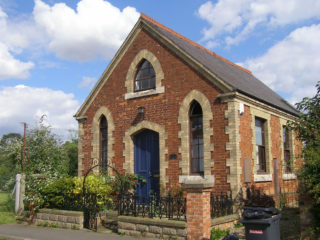 Muston Methodist Chapel, now a private residence. 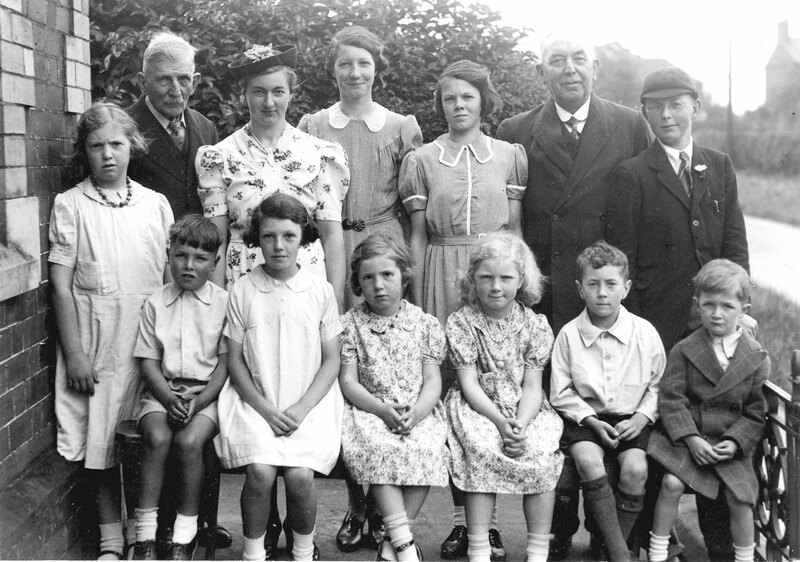 The small Methodist Sunday School class stand together in the small forecourt of Muston’s Methodist Chapel, now a private residence. The individuals in this superb picture were identified by Mrs Ruby Calcraft. Mrs Calcraft added that there were at this time three Calcraft families, who lived at (1) Sedgebrook Mill Farm (Sedgebrook parish), (2) Breeder Hills Farm (also in the adjoining parish of Sedgebrook, Lincolnshire), and (3) Sykes Lane Farm in Muston. 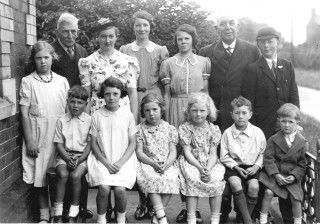 Back row L ro R: Mary Calcraft (3) (born on 12th November 1929), Mr James North (Sunday School teacher, aged 80), Edna Calcraft (3), Marjorie Calcraft (2), Betty Calcraft (2), Mr Johnson (also a teacher, said to have been “Lucy and Annie’s father” though it is unclear who this refers to for the present), Frank Calcraft (1). Front row L to R: Peter Robinson, Pat Calcraft (2), Hilda Calcraft (3), Ann Calcraft (3), Peter Calcraft (1), Melvyn Bradbury. From the private collection of Mr Melvin Bradbury. 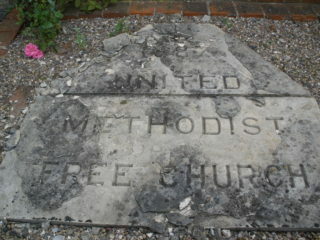 Muston Chapel inauguration stone, 1887, lying in the small yard in front of the chapel. One thing leads to another, as they say. This post started as an investigation of men from Muston who might have served with the forces during WW1. Unlike Bottesford, Muston possesses no contemporary list of village WW1 servicemen, so we have to resort to trawling the 1911 census and any other source that we come across in order to find those who might have joined up. In this case, it appeared that the subject of the study, John Henry Carman, emigrated to Canada around the start of the war, and as yet there is no indication that he joined the Canadian force or otherwise took part in the conflict. But oddly the story finds its way back to Muston, and an article published in 1939 in the Grantham Journal (available online via the British Newspaper Archive), which links the Carmans with the history of Muston’s former Methodist Chapel and Sunday School. John Henry Carman was born in 1891 at Pinchbeck, Lincolnshire. In 1911, he was living with his family at Muston Gorse, a strong twenty year old helping his father run their farm. His father was John Thomas Carman born in 1866 in Thorney Fen, Cambs. His mother Emma Scotney was born in 1869 in Spanby, near Sleaford, Lincs. They married on the 10th June 1889, at West Pinchbeck. In 1891, John Thomas Carman worked as agricultural labourer, living at Pinchbeck with Emma and their baby son John Henry. In 1901, John Thomas, now a railway labourer, and Emma lived at 29, Bottesford High Street. They now had three children, John Henry aged 10, George Riley aged 8 and Sarah E. aged 5. Then, in the 1911 census, the family were living at Muston Gorse, by the Grantham Canal. John Thomas was now a farmer in his own right. John Henry was described as a “farmer’s son working on farm”, while his sister Sarah was a “farmer’s daughter” doing “dairy work”. There was also fourteen year old George Coddington employed as a general farm labourer. George Carman was no longer there, but the census gives no indication of his whereabouts. There is are online records showing that all the family emigrated to Canada between 1910 and 1915. First to make the journey was John Henry’s younger brother George. He sailed on the 5th May 1910 aboard the “Tunisian”, Allen Line Steamship Co. Ltd, out of Liverpool bound for Quebec. John Henry Carman was the next to go, sailing from Liverpool to Quebec aboard the “Canada”, White Star Dominion Line, departing June 15th 1912. Records provided by the ‘Carman Family Tree’ (Ancestry, public family trees) indicate that John Henry returned to England soon after, and then travelled out a second time in 1915. Presumably, this was when his sister and father also made the voyage, assured by their son’s success and optimism. There is as yet no record to confirm that his mother, Emma Carman, also emigrated, and it seems likely that she had died before or during 1915, after the 1911 census. There is the record of the death of an Emma E Carman at Ely, Cambridgeshire, in 1915, which may refer to John’s mother, but this is not at all certain. Canadian census records of 1921 indicate that John Henry and Sarah lived in the New Westminster district of British Columbia with their father. Further to that, the Carman Family Tree adds that on the 27th May, 1929, John Henry Carman married Rose Mabel Munro at Kamloops, British Columbia, and that he died in Vancouver on the 13th Match, 1943, aged 52. It is yet to be established whether John Henry enlisted during WW1. There were at least three John Henry Carman in the British forces, but it is not known if one of these was him, or if he joined up with the Canadian army. While looking for more information via the online history of the Grantham Journal, I came by chance across a long article published on the 8th July, 1939. The article, by their columnist “An Idle Fellow”, touches on a variety of characters and stories from the Grantham town and area, and includes three in series entitled “A family affair”, “They only had two scholars” and “A link with Muston”. The first talks about the Sunday School run by Mr T Johnson in the village Methodist Chapel. We learn of the Calcraft children who regularly attended, and that their grandfather Mr J Calcraft had played a prominent part in having the chapel built in 1887. Then the article describes how one of Mr Johnson’s old scholars, Mr A North of Carlton, Notts, had been traveling in Canada and, after covering some 3000 miles, had entered a Methodist Chapel in British Columbia where, to his surprise, he met two people who had come from Muston and had been taught in the Sunday School by Mr Roberts. These were John and Sarah Carman, who said they had come to Canada with their father in 1914. Mr Carman senior had been a local preacher. What a coincidence! The article also tells us that John Wesley himself had visited Muston and preached in “The Homestead”, which had become Mr Johnson’s house. The accompanying photograph, generously made available by Mr Melvin Bradbury, is thought to have been taken in front of the chapel in 1938. Surely it was taken when the “Idle Fellow” was preparing his article.